Sunday was a day with Daisy’s family, and what better way to spend it than with bawdy lasses, courageous jousters, hilarious jesters, and strong mead? No better way, of course, which is why we headed to Sterling Forest in Tuxedo, New York, to the New York State Renaissance Fair. 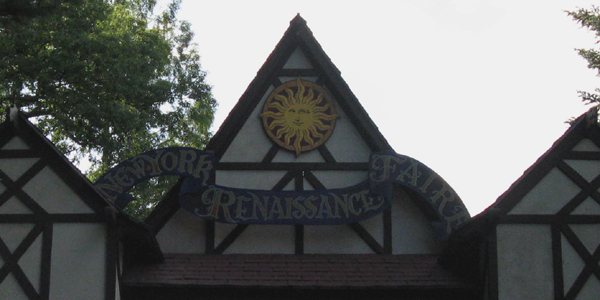 For those who don’t know, Renaissance Faires are, I believe, a uniquely American institution which feature people dressed as they imagine people did hundreds of years ago and the letter “e” at the end of almost every word on every sign. They are a place where aficionados of Dungeons and Dragons can feel at home and no one bats an eye at someone dressed up in full armor carrying a sword. And while we had a great time trying our hands at games of chance and skill, watching men on horseback compete in “jousting” tournaments, and eating delicious, though overpriced, food, the point of this post is describing the raptor exhibition put on by Earthquest, a not-for-profit environmental education organization. Steve Hoddy, one of the Earthquest animal handlers and an environmental educator for over thirty years, presented four different raptors to the delighted audience: a Red-tailed Hawk, a young Great Horned Owl, a Black Vulture, and a Gyrfalcon X Peregrine Falcon hybrid. All four birds entered and exited the “stage” under their own power, lured by small bits of raw meat, a most impressive spectacle. 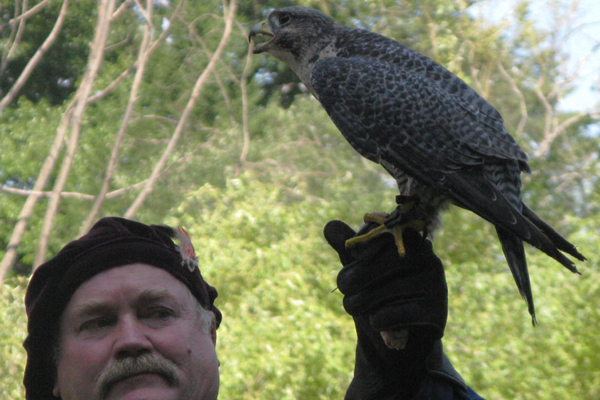 As impressive as the Great Horned Owl is the star of the show was the hybrid falcon. Steve let him fly free and brought him back to the lure a couple of times: nothing impresses like a falcon at high speed! That last pic is awesome. hahaha. 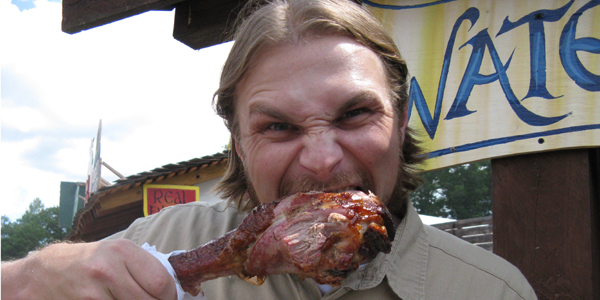 So did you have to drink like 10 gallons of water after you ate the turkey leg? I recall them being really salty, but tasty. I visited the Ren Faire many years back. It was a good time. They had good mead too. They had an Eurasian Eagle Owl when I was there too which was really cool. Now that looks like fun and a great place to learn about raptors. Don’t you mean Ye olde Byrds at Renaissance Faire?? ?